Nineteen-year-old Aziz Akbari is interviewed by a local television reporter. (CNN) – Most 18-year-olds are excited for election Tuesday because it will be their first chance to vote. Aziz Akbari is excited for a different reason: his name is on a ballot. Akbari is a sophomore at the University of Southern California studying mechanical engineering, and this year he’s thrown his hat in the ring for mayor of his hometown of Fremont, California. Akbari campaigns from his dorm room all week with the help of his campaign staff, and flies home every weekend to go door-to-door, press the flesh, and push his four-point plan to boost Fremont’s economy. But if Akbari is elected, he certainly won’t be the first teen to take charge of a city or a district. (CNN) - Lakota warrior Crazy Horse has long been a controversial figure, so perhaps it's apropos that his memorial follow suit. Though he's best known for fighting against George Armstrong Custer at the Battle of the Little Big Horn, Crazy Horse led his tribe numerous times against settlers and miners in the Dakotas, Montana and Wyoming and elsewhere before his 1877 death at Nebraska's Fort Robinson. But forget his disputed role in that battle or the claims that he's never been photographed or the conflicting tales of how he met his end - the real mystery is more contemporary: When is the sculpture in his honor going to be complete? 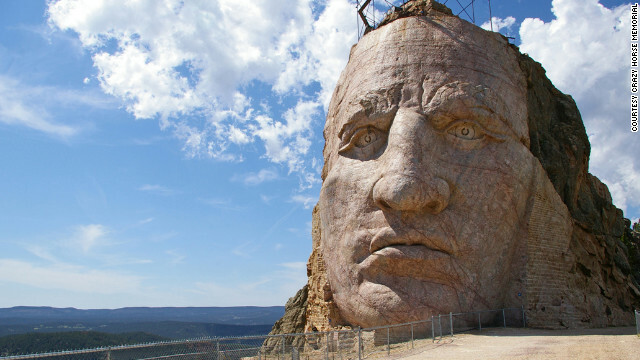 In the mountains of Black Hills, South Dakota, rests the Crazy Horse Memorial. It pays tribute to the Native American war hero with a sculpture that, at many times the size of nearby Mount Rushmore, will one day constitute the world's largest mountain carving. That is, if it ever gets completed. San Diego (CNN) - In this election, Latinos were supposed to play kingmakers. Instead they got crowned. No matter who wins on Tuesday, America's largest minority will be the loser. As a Latino voter, and part of one of the country's fastest growing demographics, I was supposed to choose the next president. No, really, it was all arranged. This was going to be my year, along with the other 10 million or so Latino voters expected to cast ballots Tuesday. Everyone said so - the pundits, the media, and the strategists. In February, Time Magazine had a cover story, with the eye-catching title, "Yo Decido" (I decide) - explaining how Latinos were going to pick the next president. Newspapers, websites, and television networks - supported financially by advertisers who wanted to tap into Latino consumers and the $1.2 trillion they spend annually - did special reports on the power of the Latino vote. The concept of Latino voting power was easy to sell. Latinos bought it so they could feel powerful, and non-Latinos bought it because many of them already feel powerless anyway due to changing demographics. There's only one problem with the storyline: It may not be true. Latino voters could wind up with very little power at all. I don't mean that their votes won't count, or that they might not help decide the outcome in a few close states - namely Colorado, Florida and Nevada. That might well happen. What I mean is that, in a broader sense, Latinos can be forgiven for feeling utterly powerless this year. It's been a tough campaign for them. They've been insulted, treated like fools, lied to, told they weren't really promised what they thought they had been, talked about behind their backs, and assured the administration is "breaking its neck" to achieve immigration reform - an issue that, in reality, was put so far on the back burner that it fell off the stove. So, regardless of what happens on Tuesday, Latinos are limping into the polling booth having been accorded no respect, no influence, no power - not because of what happens that day, but because of what happened for weeks leading up to that day.